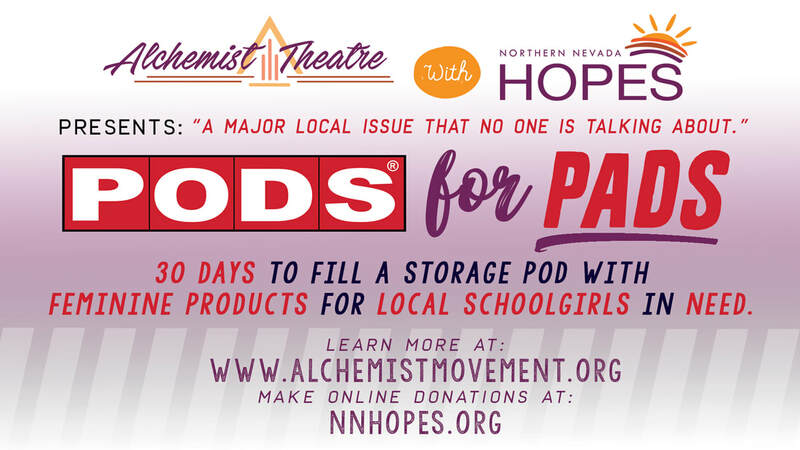 [RENO, NV] September 11, 2017: On September 20th, 2017, Alchemist Theatre combines forces with Northern Nevada HOPES to present “PODS for Pads” –a project that hopes to fill a large, 8x8 storage POD with feminine products for local schoolgirls in need. The two organizations, along with official partners Our Center, Reno Initiative for Shelter and Equality, The Eddy House and Women and Children’s Center of the Sierras, hope this project will not just procure resources for local students in need, but also create a conversation around the issue as a whole. Donations can be made during business hours at HOPES, as well as at any of their “satellite drop off locations”, whose information is available at www.alchemistmovement.org. Additionally, supporters can make tax-deductible donations online at nnhopes.org. The POD, located at HOPES on 580 W. 5th St, will be open from 3-6pm on Fridays for in-person donations. This grand endeavor will be launched live at Alchemist Theatre’s September show, and close a few days after their October show. The project creators will utilize social media to create a buzz, spread the word, and update followers on progress of the mission. Donations will then be sorted, counted, and delivered to Title I schools in Washoe County, based on need assessed by their school nurses. Northern Nevada HOPES is a nonprofit community health center located in downtown Reno, Nevada. HOPES provides integrated medical and wellness services, with a focus on lowering barriers to care for underserved communities. Services offered include adult and pediatric primary care, chronic disease management, behavioral health counseling, substance use counseling, case management, nutrition, pharmacy, transportation, and community outreach and education. HOPES’ welcoming and innovative one-stop-shop healthcare model improves access to care for thousands of individuals and families in in northern Nevada. Alchemist Theatre (Alchemist Movement, LLC) is an interfaith theatre organization that inspires real change by creating new ways of gathering and worship. Through live shows featuring music, sermons, and performance art, The Alchemists encourage people to build a stronger connection to a Higher Power of one’s choosing, and to transform into a better version of oneself. All donations made online through nnhopes.org are tax-deductible and money will be used to by products and placed in the POD!